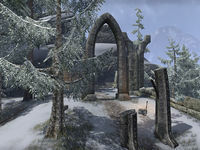 Sedor is an Ayleid ruin in northeastern Cyrodiil, west of Kingscrest Keep. Three Guardians of Sedor can be found here, although it isn't necessary to fight them to reach the nearby skyshard. Sedor also appeared in Oblivion. This page was last modified on 19 November 2018, at 05:41.